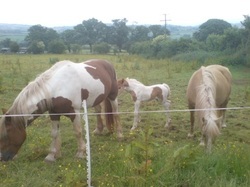 Over the many years I have kept horses the vast amount I’ve learnt has been from the horse, for many years I have observed foals being born and reared in a herd environment on my own yard of 41 acres. In the first year I would have removed the stallion prior to foaling but then realized that this would not have happened in the wild so decided to leave the stallion in the following year not knowing what was going to happen in this reasonably small environment. I observed this year that when the mares visited the stallion the resident herd of mares, foals and geldings would move to one corner leaving the stallion and visiting mares alone, the stallion would stay with the visiting mares for 2 or 3 days or until they had all been served, at this point they would all join the main herd, all the resident mares were in foal and most of the time harmony prevailed. When the first mare foaled she would find her own space within the field to foal and for around 7 days would not mix with the herd or leave the foal this strengthened their bond in sight, smell and sound, enabling them to find their mother no matter where they were, at this point the foal would introduce itself gradually to the herd, I observed that quite often one of the other horses would almost be acting as a nanny. After 2 or 3 weeks the foal would spend more time with the stallion and the other horses returning to the mare for food or extra special comfort. This was certainly the case for the majority of our mares with one exception, we have one mare on the yard with poor eyesight in her right eye, in this instance two of the bigger horses, one mare and one gelding appeared to be her bodyguards from the moment she gave birth, standing a short distance from her but making sure nothing else came into that space, when she went to go across the field to have a drink one would go in front to move the other horses and one would be behind, very early in the foals life she had a permanent nanny and 2yrs on they still spend a lot of time together. My belief is they learn as much from the stallion as they do from their mother, they learn what they can do and get away with. Most of you will be thinking this is just about the stable but I do not find this is the case, I think that most horses in our care are in a cage of one sort or another, 10 acres can still be a cage. To feel free and be able to find all they need they would need hundreds of acres. We must do our best for the horse; it totally relies upon us for most of its needs, so we must try to provide them to the best of our ability, in the environment in which the horse is kept. Proportionally hamsters have more room to move in their cage than a horse in the average stable, therefore, I feel that stables should be at least 20 ft by 20 ft this would be big enough for the horse to be able to move freely, lie-down and roll, it should have good ventilation, horses should be able to see out and have ample feed and fresh water at all times, it should have sufficient litter of one description or another, objects in a stable keep the horse occupied to avoid boredom, these can be balls, scratching areas, Astroturf fitted to the wall works perfectly, unbreakable mirror, feed hidden amongst the hay, I find a reasonable sized ash log works well, this gives them something to chew and play with but also provides important extracts, the stable should be kept clean and reasonably odour free to avoid a build up of bacteria and fungal spores, deep litter works really well but you must remove the wet areas and remove the poo, low volume music also helps, horses really need company they are a herd animal ideally there will be at least two, some horses find cats and dogs company but there really is nothing like their own kind, if the horse is kept in a stable you should visit it as frequently as possible throughout the day and into the evening, a domesticated horse enjoys and respects human company. You must check their feet on a regular basis and keep them trimmed ,regular physical contact I feel is important so in my case I groom the horses with my hands and arms, this enables me to locate any unusual points that may show up, such as lumps and bumps cuts and grazes hot and cold areas tight muscles etc. giving me the chance to look closer and take the appropriate action. I prefer to keep my horses out 24/7 I do not shoe, clip or rug, shoeing and rugging should be used for the benefit of the horse not the benefit of the keeper, clipping would be acceptable if purely for the benefit of the horse. The largest area possible should be made available to the horses throughout the year, taking into account sufficient room to move freely, access to fresh water constantly and a good supply of forage, two acres per horse should be the minimum, in an ideal situation the horses would have far more but most of us are restricted but nevertheless we must try to provide to the best of our ability all the horse needs. We must never forget it is our choice to keep the horse not the horse’s choice to be kept. They should have shelter from the Sun, wind and rain this can be in the form of a purpose built building, tall hedge rows, big trees as long as they can get shelter when they decide they need it People new to this way of keeping horses will be surprised that in some of the worst weather the horse may choose to shelter in the hedge or stand in the middle of the field but in my experience very rarely in the shelter, except in extremely hot weather but providing we have given them the choice they can make the decision them selves, certainly during the winter months they need ad-lib hay in front of them 24/7. During the winter months I feel it’s acceptable to keep them in a very large barn, or hard standing yard with shelter, providing they have ample feed and water this can be more desirable than keeping them up to their knees in mud when their hooves get too soft. On an ideal yard they would have different surfaces to walk upon pebbles, coarse grit, sand, and a smooth area like Tarmac with access to paddocks when the weather permits, it’s no good keeping a horse in mud they will not move about, there will be not sufficient to eat so there will be no benefit. During this time they should be in the same groups as the rest of the year, Horse Company is really important they help each other keep warm. They mutually groom and generally are better behaved. Horses kept in or out in any of the above-mentioned need a regular routine, routine can be anything, I believe that even no routine becomes routine, to the horse this is more the case during the winter months, if you always do your horses between 7.30 and 8.30 the horse soon becomes to expect this, to keep the bonds and respect, routine is most important having said all this you will be forgiven on the odd occasion. I do know one lady who used to always ride or work her horse around 2.30, for no apparent reason she gave this up for quite a long time, the horse would just stand and wait for her to turn up, in the end when she finally came back thinking she could start where she left off she was very much mistaken, the horse at this time could not understand why something so constant had been missed for no apparent reason, it took her about three weeks to get back to where she was and once again the horse would wait for her, this was a horse kept in a herd of about 15. Horses do not appreciate that there maybe a shortage of food therefore they eat all they want when they want it, they will not save any for later which is why sufficient quantities fodder should be in front of them at all times, two wedges of hay given at 6 o'clock at night will not last till 6 or 7 o'clock the following morning, if they have nothing to do and nothing to eat boredom soon set in then other problems can occur. If you have good draining land a small number of horses per acre over the winter months can work, providing there is shelter available there should be no problem, good pasture management is most important there are a few good seed merchants about that will give you advice on what to plant, Lorraine of Natural horsemanship magazine runs good courses on pasture management, in my opinion the bigger variety of forage the better, I am totally convinced they need a lot more than just grass, just grass is like us having just potatoes or just rice we would survive but probably be bored, given the choice at different times they will choose different things to eat, they are far better at choosing given the choice than we will ever be, so what ever space we keep our horses in we must remember they are our responsibility through our choice not theirs. Thinking about what I do, how I do it, there’s a lot of things I do and not necessarily think about consciously, picking up signals from horses, come in a lot of different ways, sometimes the horse will indicate to me by a movement, pointing of the nose, swishing of the tail, lifting of a leg, the signals also come sometimes by reflected pain, itch or irritation on my own body, sometimes the tingling, cold or heat through my hands, sometimes a smell, all sorts of smells, foul smells, essential oil type smells, hay, grass, the sea sometimes indicating an organ problem or indicating a need in the diet, sometimes an internal sound, very occasionally a vision, this has only happened in the most severe cases, if I cannot pick up the signal I ask the horse to give it to me again, if I still fail I ask the horse to give it to me again in a different form, I find sometimes having hands on helps but quite often I will stand back 2 or 3 feet to try and understand, casting my eyes constantly across the horse, I spend a lot of time twisting and moving my body to work out positions that might relate to the horse, quite often a front problem can be compensatory of a rear problem, if I fail to work out the problem it normally comes to me within 24 hrs I then have no problem in ringing the client and saying I need to re-visit the horse again and explain the reason why, I’ve never had a taste but I don’t see any reason the signal shouldn’t be in taste form, the gut feeling is normally the one to go with, if you work with this you can then continue on with other signals, I also have the ability to shut my eyes and open up a third eye which appears to be placed just above the top of the nose, I can get images through this third eye, I don’t truly understand how or why but I don’t try to, sometimes it’s just a blank screen, I do believe the carrying of crystals helps in some way, I do not understand this, but I do aim to understand crystals more, I always carry smoked quartz and a pure crystal, I have on some occasions held the crystal against the horse to try and understand, I occasionally find it very difficult to pick up the horses’ energy if there are humans present, I do not have this problem if there are lots of horses though, I can focus on just the one although in some instances I have picked up the problem in the horse through a problem in the human, human out of balance, fizzy, laid back, bad hips, bad back, stiff shoulders etc sometimes reflect in the horse especially if the horse is ridden, having said all this it is sometimes incredibly difficult for me to understand my own horses without specifically concentrating I think this is spending all my time with them, looking, listening but not always seeing or hearing, I have learnt many lessons over the last few years which have improved this, some good and some not so good , I do find that back diagnosis and leg rotation as very useful tool, I find that sometimes I have to think quite hard to relate this diagnosis to the problem as sometimes there is no apparent link, remember at the time you are treating someone else’s horse you know more about that horse than they do, in Shiatsu I am not sure that you need to work an exact specific points but just need to be in close proximity to it, and tell your client what you feel, no matter what this is, good or bad, they will either accept it or not, but if you don’t tell them they will not have the choice, when things are not working as well as you would like I’m sure there is a reason, I feel this is nothing to do with our ability, we just need to listen, look and learn, every treatment I give to a horse benefits it in one way or another not always as we or the owner expects, I feel it’s ok to tell the owner to change their style of riding, change their tack, change their feed regime, change the way the horse is kept if this is the feeling I’m getting from the horse, all sorts of problems can be purely emotional, it doesn’t matter how much work we do to a particular horse if its life style is wrong we are fighting an uphill battle, if we drive a car without any brakes we will crash into things no matter how many times we repair the damage to the car unless we fix the brakes we will keep crashing, this is exactly the same with the horse, you resolve its problems but not the causes so we must remember to treat the whole, their physical being, their emotional side and the environment in which they’re kept always doing it with the best intent and love coming from our sole.